There is an area located in just about the geographic center of Imperial Valley called the Mesquite Lake Basin. Never seen Mesquite Lake?! Well it has not been a lake since the very early 1900’s so I have never seen it either but the birding can be great there! I made a birding pass through there just before sunset yesterday. But first I need to add access information for anyone contemplating birding here this coming weekend. CATTLE CALL PARK in Brawley is currently closed due to flooding by the New River. I subscribe to a service of the USGS that sends out alerts for waterways in which water levels are above or below certain parameters that you select. This is the alert that I received yesterday! And now back to Mesquite Lake. Getting there was half of the fun. 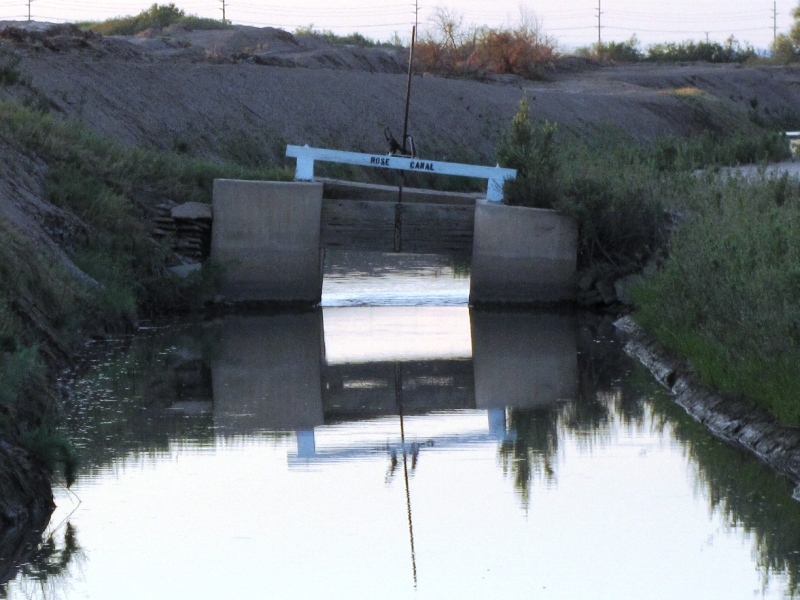 I left the office in SW El Centro and stopped at a small drain canal that was a river two days ago. The drain runs south across East Heil Avenue between Dogwood Road and Industry Way. I walked it for a ways looking for dragonflies. 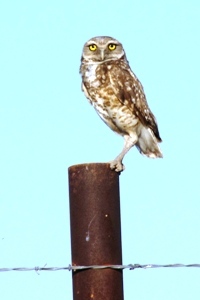 Rambur’s Forktail, Spot-winged Glider and Common Green Darner were present but also present was a pair of Burrowing Owls with at least one young. Their den was just barely above the high water mark! 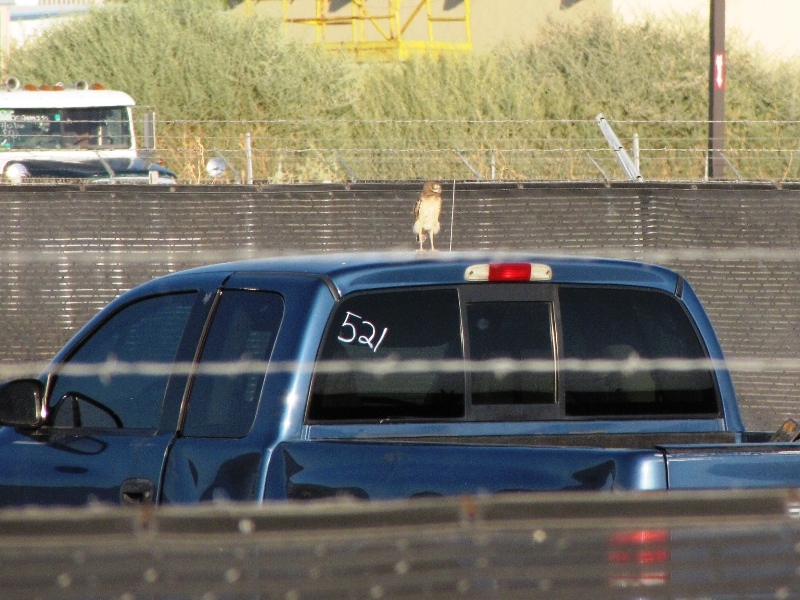 Here are pictures of a parent on a fence post and the young on a ….Dodge? 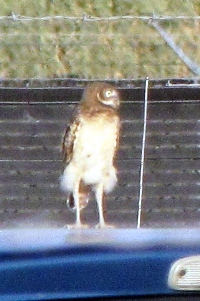 The young have a brown head and creamy white breast. The area called Mesquite Lake is just south of Brawley. It is roughly bounded by Brawley on the north, the railroad tracks on the west, Ralph Road and Highway 111 near Worthington Road on the south and McConnell Road on the east. 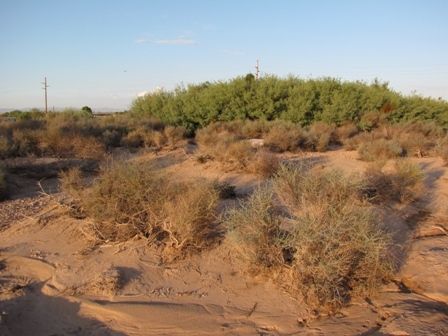 It is known as the Mesquite Lake block or basin. Block because it is basically surrounded by earthquake fault lines and is sinking faster than the rest of the Imperial Valley. Basin because it was one of the last areas to be drained and brought into agriculture but the salinity is too high to be farmed easily. There are several fish farms and waterfowl hunting areas here and it is one of the favored wintering locations for about 500 plus Sandhill Crane every winter. The basin is quite obvious as you drop into it from the south or the west. This is some of the habitat along the bluff of the faultline at Doogwood Road just south of Harris Road. Very good loacation to find Abert’s Towhee and Black-tailed Gnatcatcher! The Rose Canal meanders along with the western edge of this faultine and shows evidence of that in this picture of a canal gate. I have pictures of the date on this gate someplace but seem to recall the date was about 1939. 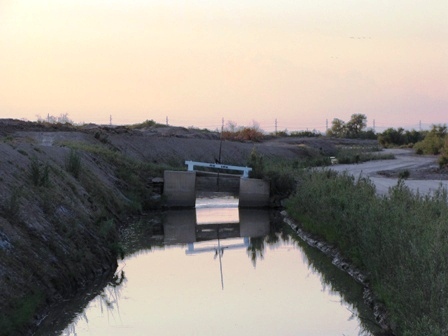 Here is a very handy link for maps of the Imperial Irrigation District (IID) canals, drains and the Colorado River. Following is my eBird report. Comments: Temperature about 95 w/ very high humidity w/ no wind. Pulled off of Dogwood Road onto the south bank of Rose Canal, just south of Harris Road, and headed west. Birded the mesquite trees there on foot for about 20 minutes then drove the canal to where it crosses Keystone Road. Signs of very heavy water runoff from the monsoon storm two days previous with standing water amidst the mesquite trees. West bank of the Rose north from Harris Road was closed due to flooding. East bank open and good. ABout 15 Spot-winged Glider dragonflies while walking the mesquite trees. See ya at the sea…………….